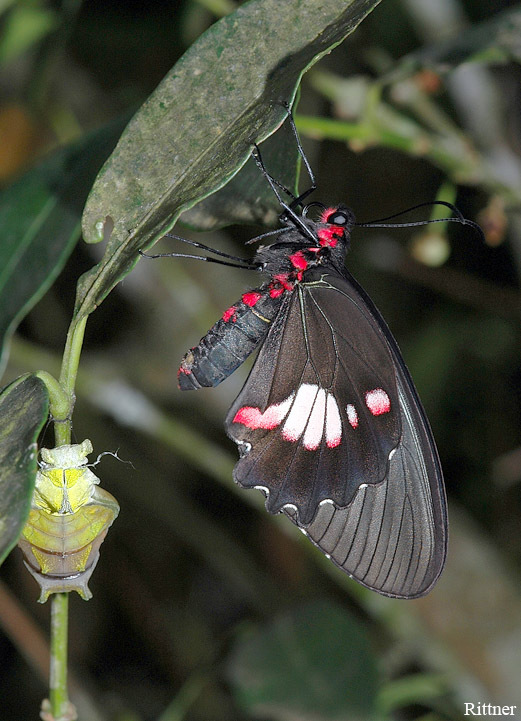 Parides anchises nephalion (Godart, 1819) from the Papilionidae family. I had great luck to capture this one as it was not moving as I approached. Only as I was very close to it I noticed the empty Pupa next to him and only then I realized it was unfolding its wings. I took the shot from a bridge that was high and near the canopy. the butterfly was almost 2 meters from me so I had to hold my camera far from my face and hold it still. This is my first Parides photographed at the wild so I was very excited about it. I also liked the bright colors of the pupa which I have never seen before. A wonderful moment to witness. The butterfly is well in focus and the empty pupa shell also beautifully captured. TFS this fine image. Hi Oz and nice to see you back! This is a splendid macro shot taken at a terrific moment! The butterfly is superbly shown and very detailed, too. The sharpness is impeccable and the contrast and colors are amazing, as well. The capture of the pupa in the same frame is a great bonus to the composition and the picture itself. That's why, the DOF that you chose here is great - keeping both of them in such a good focus. But where do you find so amazing butterflies!? I'm jalous! Very nice shot with a very good focus and great colors. Very nice capture! Sharpness and colours are good! Wonderful composition with magnicifent colors! Impressive the wealth of details. Outstanding shot with such impressive sharpness and lovely colours. The butterfly looks fresh and the empty pupa confirms it - great moment captured. Good use of flash lighting and I like the natural surrounding too much. Excellent POV and DOF. Very nicely composed. Kudos. Great picture of this butterfly. Great color, sharpness and lighting.